Capt. Edward H. Molyneux [1891-1974], Paris, France, by 1952; sold 15 August 1955 to Ailsa Mellon Bruce [1901-1969], New York; bequest 1970 to NGA. Exhibited as part of the Molyneux collection in 1952. No provenance known prior to Molyneux, according to letter dated 22 September 1999 from Guy Cogeval, in NGA curatorial files. Acquisition date of the Molyneux collection according to the Ailsa Mellon Bruce notebook now in NGA archives. French Paintings from the Molyneux Collection, National Gallery of Art, Washington; Museum of Modern Art, New York, 1952, unnumbered checklist. Masterpieces from the National Gallery of Art, Washington, Kyoto Municipal Museum of Art; Tokyo Metropolitan Art Museum, 1999, no. 64, repro. European Paintings: An Illustrated Summary Catalogue. National Gallery of Art, Washington, 1975: 372, repro. Small French Paintings from the Bequest of Ailsa Mellon Bruce. Exh. cat. National Gallery of Art, Washington, D.C., 1978: 104, repro. (continuing exhibition beginning in 1978). European Paintings: An Illustrated Catalogue. National Gallery of Art, Washington, 1985: 432, repro. Salomon, Antoine, and Guy Cogeval. 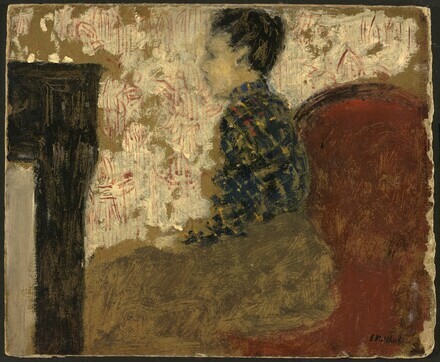 Vuillard, The Inexhaustible Glance: Critical Catalogue of Paintings and Pastels. 3 vols. Milan and Paris, 2003: 2:no. VII-187, repro.